For replacement labels, order part 113 0913. 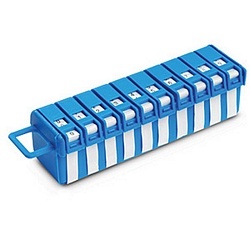 This top-loading label dispenser holds 10 rolls of 76 labels each to let you organize and label your cables with ease. Just pull the backing tape and the pre-cut adhesive label rolls out, ready to be wrapped around a cable. Includes ten rolls of numerals, 1 each of "0" through "9."